The rupee's comeback is great for the economy. But not for exporters. 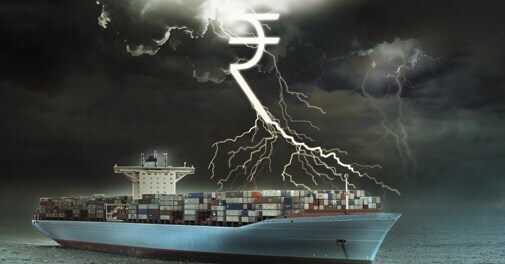 A decline in the country's exports in the last two months of the previous fiscal year, coinciding with an appreciation of the rupee, has raised questions about competitiveness of the Indian industry. Government data show shipments declined 3.67 per cent and 3.15 per cent in February and March, respectively. Exports for the year through March totalled $312.35 billion, up four per cent from the previous year but missing the government's target of $325 billion. "A depreciation of the Indian rupee against the US dollar had made exports competitive for most of the previous fiscal year. So long as it lasted, exporters, especially in segments like gems and jewellery, textile and leather, enjoyed an advantage. With the rupee appreciating and stabilising at 60 to 61 versus the dollar, the edge is gone," says Sunil Kumar Sinha, Principal Economist and Director at India Ratings and Research. Sinha says these segments are high-volume, low-margin businesses. "Players in these segments were able to compete aggressively due to the cushion they had from the rupee's depreciation last year," he says. But the resultant competitiveness was not sustainable and so things are now taking a turn. "If you have to compete on a sustainable basis, you have to increase productivity and enhance margins. This will require better infrastructure, investment in roads and ports, and access to credit at viable interest rates." 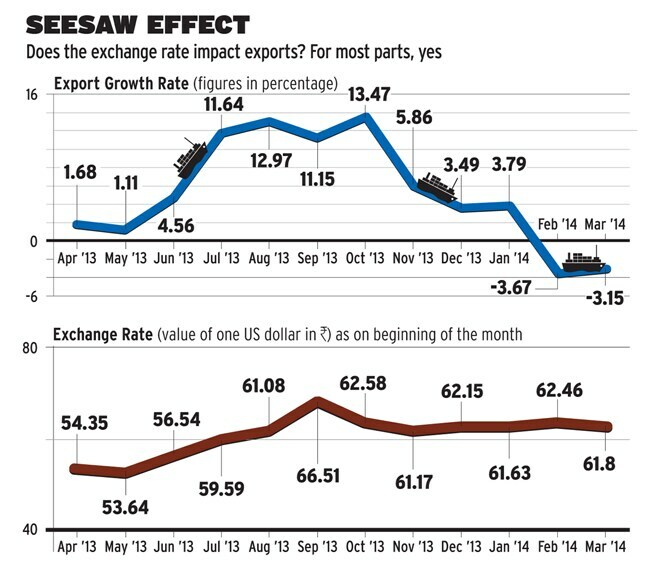 Some analysts, however, disagree that the rupee's appreciation has slowed the pace of exports. "In the past there have been phases when the rupee firmed up but exports did not drop. Let us not give much importance to it," says Biswajit Dhar, Director General, Research and Information System for Developing Countries, a think tank under the Ministry of External Affairs. Ajay Sahai, Director General and CEO of the Federation of Indian Export Organisations, agrees with Dhar. "Small exporters especially in traditional sectors like handicrafts, carpets and textiles are hit as they are not able to hedge their risk like large exporters in sectors like petroleum. The main issue leading to India missing its export target is slowing down of manufacturing, since there is a direct link between industrial output and export growth. Another reason that has led to exports slackening is the lacklustre performance of Latin American markets," he says. While the sector-wise performance for March is not available, an analysis of trends for February shows that exports of petroleum products and gems and jewellery have taken a hit. The two segments together account for one-third of the country's exports. A CRISIL analysis attributes the slowdown in exports since November 2013 to a fall in the value of petroleum products and gems and jewellery. Take the case of petroleum products, which account for close to one-fifth of India's exports. In February, the volume of petroleum products exported grew 14 per cent from a year earlier to 5.2 million tonnes, show data compiled by the Petroleum Planning and Analysis Cell, a wing of petroleum ministry. However, the value of exports grew only seven per cent to $4.76 billion. Petroleum products export had peaked to $6.40 billion in September 2013 but started declining from October onwards. In the April-to-February period of the last fiscal year, petroleum exports grew 9.22 per cent in volume terms but only five per cent in value terms. The export slowdown since November is due mainly to a fall in the value of petroleum products and gems and jewellery. Data with the Gems and Jewellery Export Promotion Council show that shipments of gems and jewellery declined 10 per cent in the April-to-February period to $30.82 billion. In February, exports slipped more than eight per cent to $3.15 billion. The segment accounts for 13 per cent of India's exports. The council said in February that the sector has posted a drop in exports for a year, hurt by the government's steps to curb gold imports as part of efforts to bring down the current account deficit. Dhar says the drop in exports is because of varying market conditions. "Too many countries are vying to get a pie of the global export market. There have been uncertainties in the global market. We are in a situation where we have to push exports as much as we can," he says. Incidentally, China also reported a drop in exports. In March, exports from the biggest Asian economy dropped 6.6 per cent. Sinha said a drop in Chinese shipments isn't surprising because the nation exports primarily to the developed markets, which are barely growing. "If China is facing a drop you know what the export market is like," says Dhar. Both Sinha and Dhar are not hoping a dramatic change in exports in the current fiscal year. "If you look at the trend of the past few years, we have been losing competitiveness. I do not expect a major turnaround this year unless we look at all the problems from the shop floor to the high transaction costs," adds Dhar. What will it take for Sun Pharma to turn Ranbaxy around?